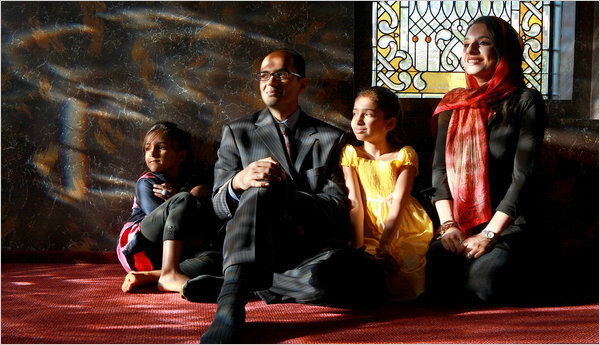 A Muslim family in America. Source: The New York Times. To the extent that Muslims adopt Western culture, customs, values, and behaviors, yes, they do indeed belong. A society is a group of people who share those things. And there’s the rub. Whatever its merits or demerits as a religion, Islam is not a significant part of Western history and culture except as an antagonist. Muslims stand outside the Western tradition. It’s important to understand what that means and what it does not mean. It does not mean that Muslims are bad people or that they are necessarily our enemies. It does not mean that they can’t contribute to our society and be accepted in most contexts. It doesn’t even mean that Islam itself has nothing to offer us in religious insights or examples of faith and courage. What it does mean is that by their answer to one of the most important questions of life, “What’s it all about,” Muslims stand apart. They do not belong. And depending on how they interpret their faith, it means that they disagree with some of Western civilization’s fundamental conclusions about justice, individual rights, freedom of religion, the role of government, and the relationship between humanity and God. It also means that most Western people will regard them with just a little bit of doubt. The more values and beliefs that people share, the more they feel confident that they understand each other and can trust each other. Don’t blame me for it: that’s just the fact. There are both valid and invalid reasons for it. And it has nothing specific to do with Islam. It applies to all differences between people. The more extensive and important the differences, the greater is the potential for distrust, misunderstanding, and hostility. Difference is not a license to treat anyone with less than the respect and love that all people deserve. But it’s foolish to pretend that the difference doesn’t exist. I agree with you in the nature of the conflict but not necessarily in the target. I see all these same issues in religious fundamentalists of all stripes, not just Muslims. Because of their numbers, because of the automatic ‘in’ their long tradition in our society gives them, because they lack much of that “foreignness” that sets off suspicion in the lower reaches of most Western brains, I consider Christian fundamentalists a FAR greater threat to my liberties than any Muslim. Muslim extremists may physically harm some people; we’ve seen that. But they’ll never be in an unopposed position to try to tell me who I can spend my life with, or what book the laws that affect my life and its prospects should be taken from, or what can or can’t be shown on television, said on the radio, or put on the shelves of school libraries. They’ll also never have the ability to send supercarrier fleets overseas to try to force their values on others. I’m less concerned about Muslims per se as I am religious fundamentalists in general. A moderate Muslim (Christian, Jew, what-have-you) is no threat to me. These people who home-school, send their kids to Jesus Camp, deny the facts of science while indulging in its bounties, and put bumper stickers on their cars warning others that it will go out of control when the Rapture comes (with all that implies for their dedication to a better future for posterity) definitely are. Those people decidedly do NOT fit in with multi-ethnic, multicultural Western societies… but the scary thing is, they’re already here in their millions. When are THEY finally going to assimilate? Those are all perceptive observations. I do think, however, that we’re talking about slightly different things. The question of whether members of group X belong to a society is a different question from whether they are a threat to it or its members. I suggest that Muslims as a group are not a threat to our society, but that they also (as Muslims) don’t belong to it. Determining membership in societies is not an entirely rational thing. It stems at least in part from sociobiology. We tend to trust and support those with whom we share genes. The closer our genetic relationship, the greater the inclination to trust and support; the converse also holds. We recognize genetic kinship at the most basic level by physical appearance. Members of our families look like us, as do members of our own races and nationalities. Beyond that, we unconsciously use other factors as proxies for purely genetic relatedness: shared religion, shared language, and so forth. Of course, such factors are not purely irrational and subconscious. The more you have in common with someone, the better you understand him or her, and the more rational it is to trust because you can predict the person’s behavior. One point where we might have an interesting discussion is what constitutes a society. I think there is an argument to be made that “multi-ethnic, multi-cultural” societies are not societies at all, in that their members do not have enough in common. They might be economic systems, or markets, or political units, but not societies and certainly not nations. A little bit of diversity is a good thing. Too much means that a social unit is always on the verge of disintegration. In fact, we’ve already spent a good deal of time discussing one example: the Union and Confederate states. Whatever the merits of the arguments about the war, it’s indisputable that those areas had different cultures and values, which was the main reason for the initial breakup. Are you denying such people exist, Jet? Yes, I’m putting a fine point on it, to be sure. But for me, this is where the real threat to Western civilization comes from. Not a trickle of foreigners, who, by and large, can and will be assimilated by the general culture over time (as with every other “threat” we’ve ever been warned of, from the Irish on down), but from within… those smiling faces with unaccented voices paying lip service to our civilization while aiming to lobotomize it from the 17th century on up. It’s an interesting question to ask; what does it mean to “belong” to a society? For example, do you and I share a society? There are two immediate answers to this: yes and no. No, because what’s now Canada and what’s now the United States went different ways in the 1770s (funny you’d call the Civil War a “revolution”; I’ve long seen the American Revolution as a civil war) and we don’t share a nationality or polity; but yes, because we and other countries are core-Western countries that share institutions and assumptions about the nature of conduct of society that, to a great extent, mesh at the edges beyond our national boundaries. With the exception of the particulars of political culture I’m more inclined to say we do share a society than that we don’t. In my estimation, the set and subsets of what constitutes any person’s society as expanded over time. Initially, it was just the people you actually knew. Then it was the people who shared your language–the ability to communicate and thus work cooperatively being fundamental to a corporate identity; how many nations in the world simply call themselves “the people” in their own language? Eventually it came to include those former foreigners who lived among us, and who changed our ways while we changed theirs. In the largest sense, we now mean everyone in the world. To some extent, there are no outsiders anymore; the world has been made effectively a single place in our lifetimes. Ideas about who’s in and who’s not tend to persist. They can be harmful to the cohesion of society, force those who would be “us” into the necessary role of outsider. I’m endlessly amused by sneering references by some Englishmen to the “foreignness” of the Royal Family; the usual calumny is that they are “German”. Just where do they think the English themselves hail from? It’s hilarious that these Anglo-Saxons never stop to reflect that Saxony isn’t in Lincolnshire or Northumbria. It’s in Germany. So who’s outside, and how long do we hang onto these perceptions? But I come back to my original point. Christian fundamentalists do share a language with me, but they use it to promote ideas that are not mine, and are not reflective of our society in general. Perhaps they were, once, but now they have more in kin with the ideas of fundamentalist Muslims. The only differences are the prayers and the nature of the supposed deity to which they’re rendered up; the effects are much the same: the disenfranchisement of people different from them, the return of women to roles of subservience, the shaping of modern society in accord with precepts created to shape Bronze and Iron Age societies, and a mistrust of science, inquiry, questioning received authority, and the general advancement it brings. An insistence that, finally, we all must be the same, think the say, speak the same and do the same. Just being Muslim in and of itself does not make you an outsider to me anymore than being a Jew does. What makes someone an outsider to me is an insistence in undoing all the work that has been done in the past millennium that makes my society advanced, comfortable, and workable, on the basis of what a deity supposedly told people thousands of years ago but who isn’t around to vouchsafe today. That’s fundamentalism of any stripe.